English Touring Theatre’s Othello, a co-production with Shakespeare at the Tobacco Factory and Oxford Playhouse, starts with an Islamic wedding. In director Richard Twyman’s production – originally staged with Abraham Popoola in the title role – Othello is a Muslim who has been forced to conceal his faith to navigate Venetian public life. 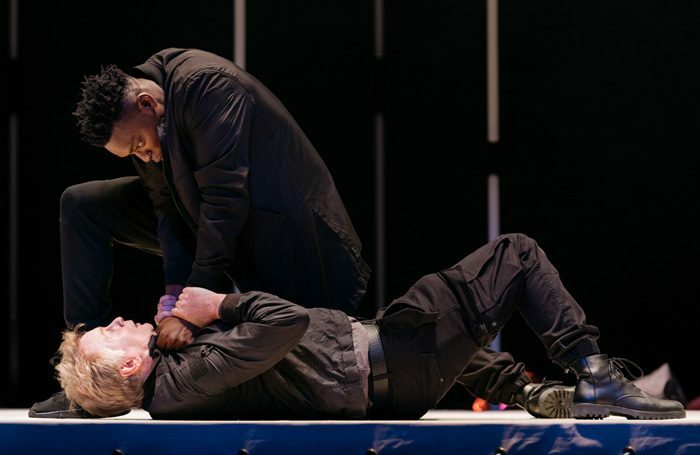 While this interpretation effectively intensifies the contemporary political resonance of prejudice directed against Othello, Victor Oshin’s performance as Othello turns inwards to suggest a character at war with himself. The ostentatious crucifix he wears doubles as a dagger. Paul McEwan is a cynical, brooding presence as Iago, watching the action from the shadows like a director. His performance is often darkly humorous, as when he lays out drinks for the soldiers as if at a children’s birthday party. Kitty Archer and Oshin capture the whirlwind romance of the beginning of Desdemona and Othello’s relationship. Archer imbues Desdemona with a startling confidence. Instead of being a lament, her ‘Willow song’ becomes a wild, tabletop dance. Oshin gives a sensitive and capable performance, although his version of Othello seems younger than the grizzled general the script might suggest. Georgia Lowe’s striking set design creates a stage within a stage, hemmed in on three sides by fluorescent lighting strips. Lowe’s set and Matt Graham’s lighting design contribute powerfully to a sense of claustrophobia as the play accelerates towards its violent ending. In one of several inspired directorial choices, the stage becomes a boxing ring as Iago goads Othello into believing that his wife is unfaithful. In the final scenes, the design resembles a cage.